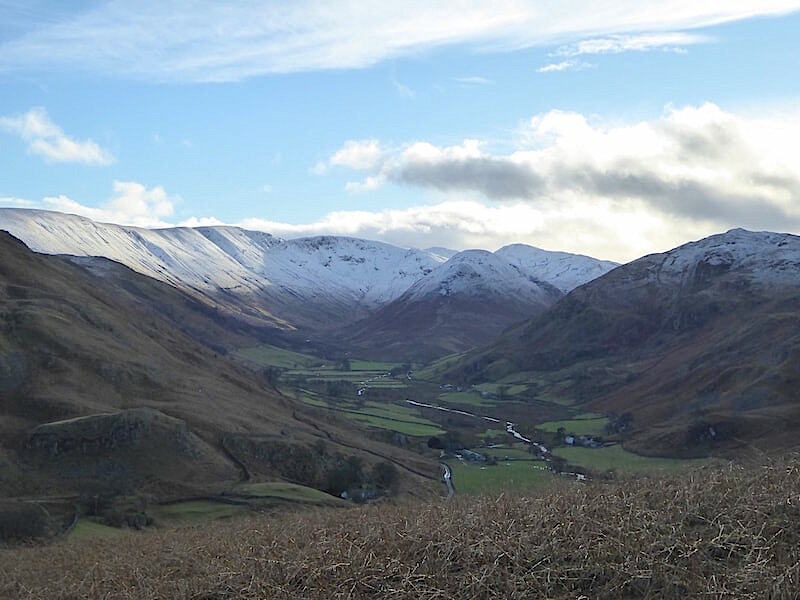 In our patch of Cumbria Christmas Day came and went in an unremitting downpour of sleety rain and high winds, accompanied by an equally unremitting diet of lamentable tv programmes. Fortunately the tv has an OFF option, but there was nothing we could do about the weather and the sleety, windy conditions continued overnight and on through to lunchtime today. We were just finishing lunch and resigning ourselves to being confined to barracks yet again when we noticed that the rain had stopped, the skies were brightening and that glimmers of sunshine were beginning to appear. 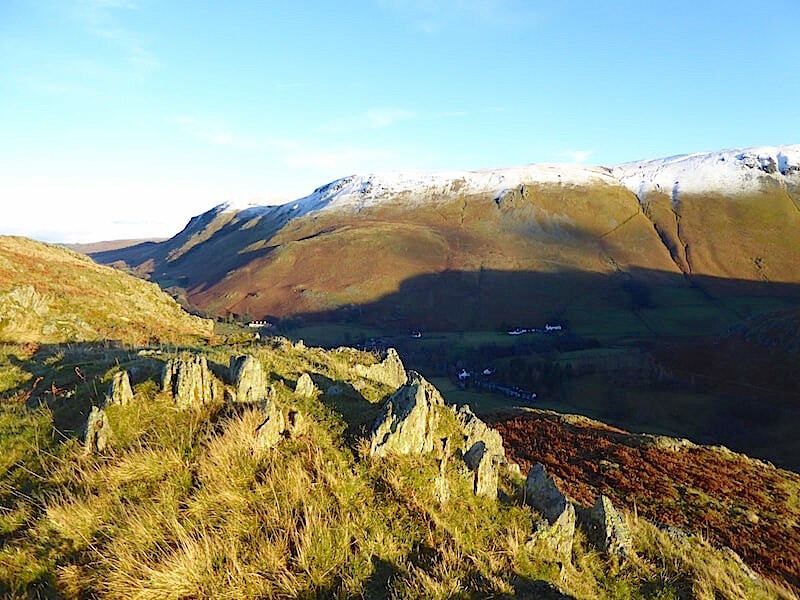 Having rubbed our eyes to make sure we weren’t witnessing some sort of mirage we hastily donned our walking gear and drove over to Howtown to spend what daylight was left taking in the air, and the views, on Hallin Fell. 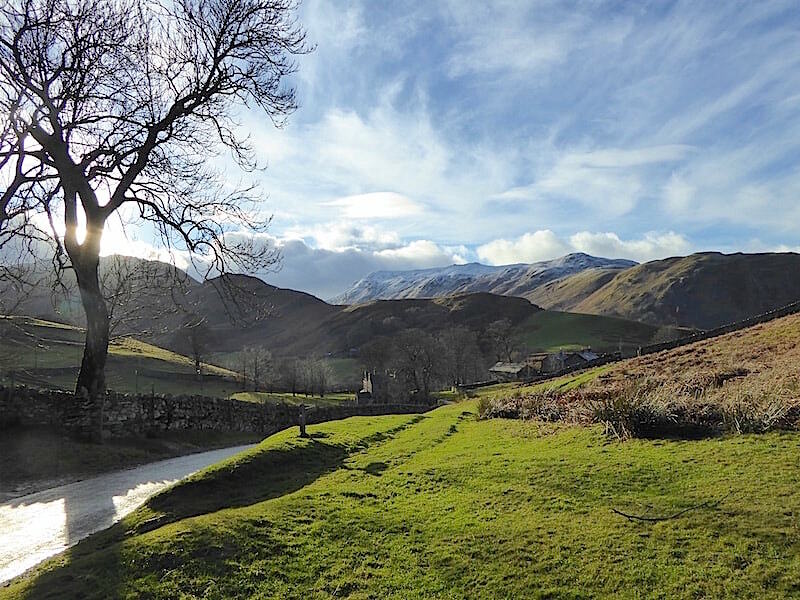 A glorious afternoon scene greeted us at The Hause although for anyone on the fells beyond Place Fell, on the centre skyline, it may not have been quite so glorious given the large amounts of cloud we could see swirling around over there. Driving up the Howtown hairpins we met a line of half a dozen cars coming down, and with a similar amount following on behind us, it was an interesting experience getting to this point. Whether it was down to this being the season of goodwill or simply the relief of drivers reaching the security of one of the passing points and being happy to sit there until the log jam cleared is hard to say, but there was quite a lot of ‘after you’, ‘no, after you’ hand signalling going on and eventually the two processions made it through without incident. 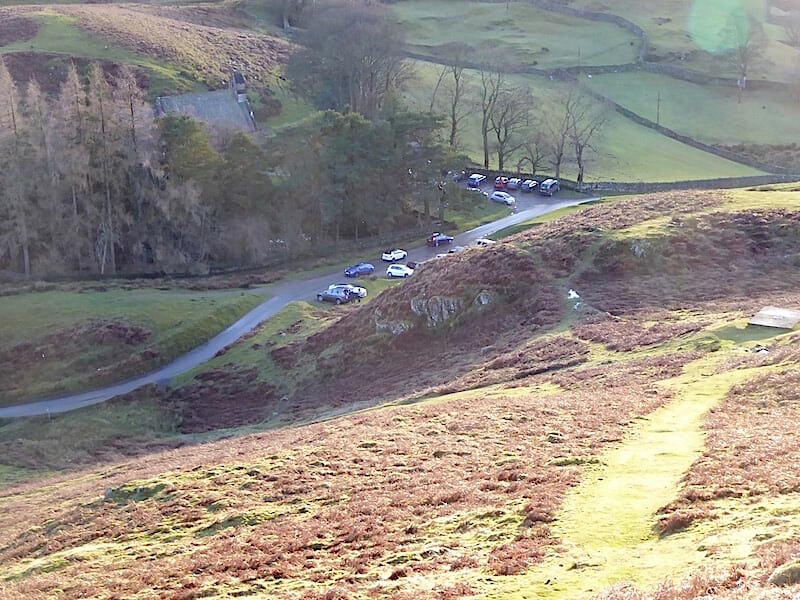 As can be seen from the photo plenty of people had decided to make use of the sunny afternoon to take a walk up Hallin Fell, and why not, because its a handy little ‘back pocket’ walk to bring out when you don’t have a whole heap of time, or the weather hasn’t left you enough daylight hours to do much else. 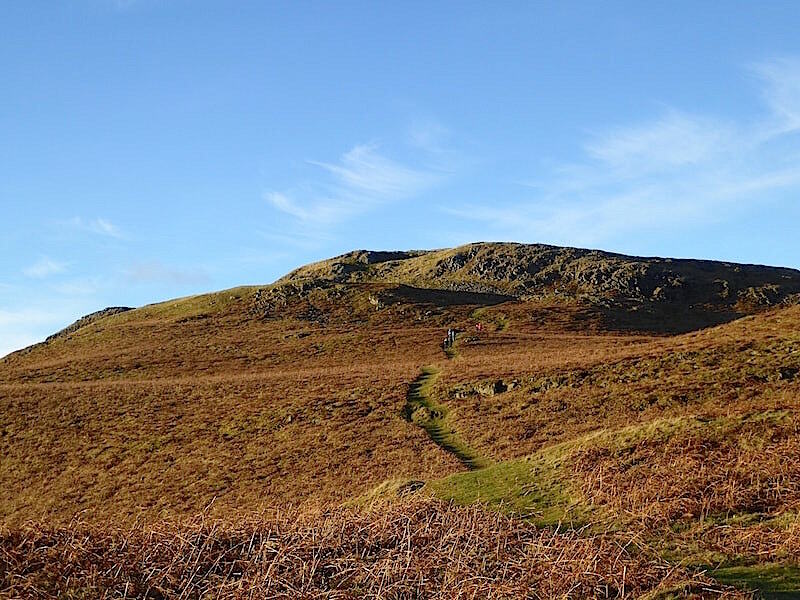 Up we go then, but not along the path in the shot, with just a quick look over at Arthur’s Pike and Bonscale Pike on our right …..
….. with the start and finish of our grand tour of Hallin Fell straight in front of us. We take the left hand path for the ascent and return via the right hand one. 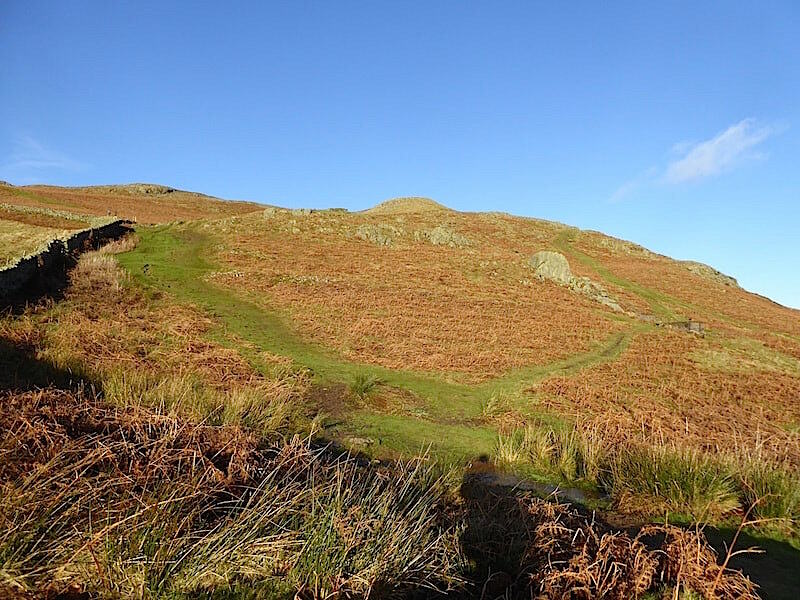 The fell appears deserted but it certainly wasn’t the case. 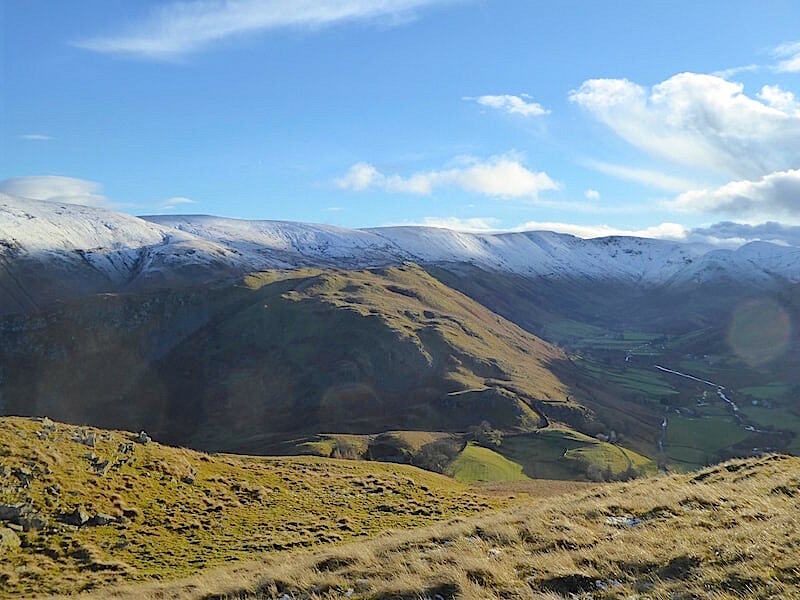 Beda Fell taking centre stage as we look along a shadowy Martindale towards The Nab. 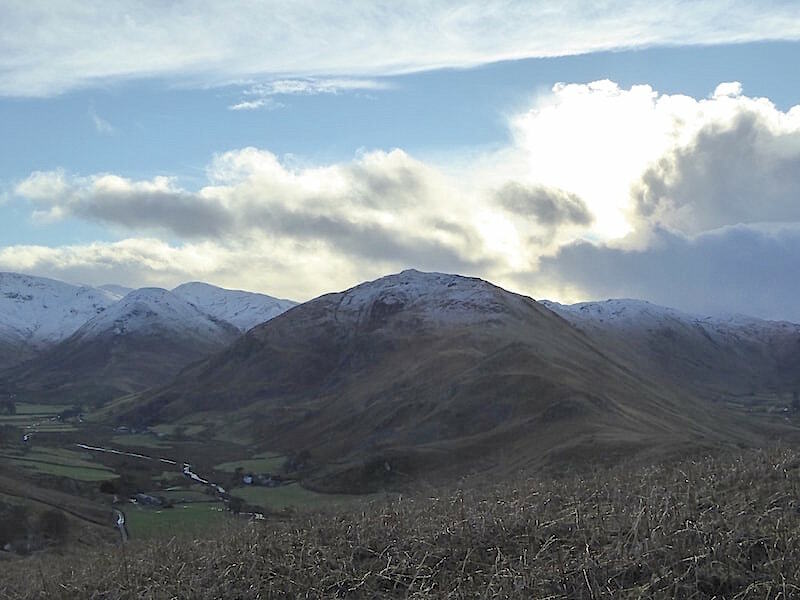 As the clouds drift by things turn a little brighter along Martindale, and we get a view of the sunny and snowy fells above Ramps Gill. 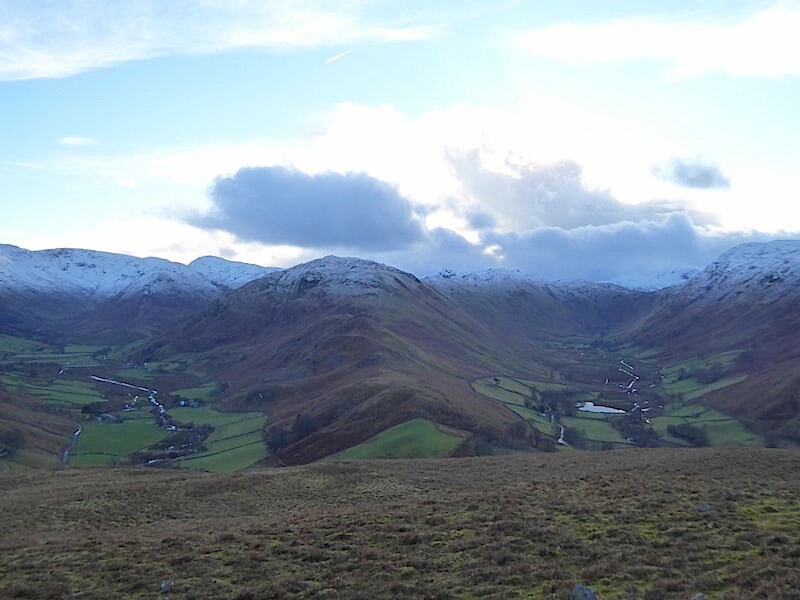 The lights go out again but we still have a decent view of Martindale, on the left, and Boredale, on the right, separated by the sprawling bulk of Beda Fell. 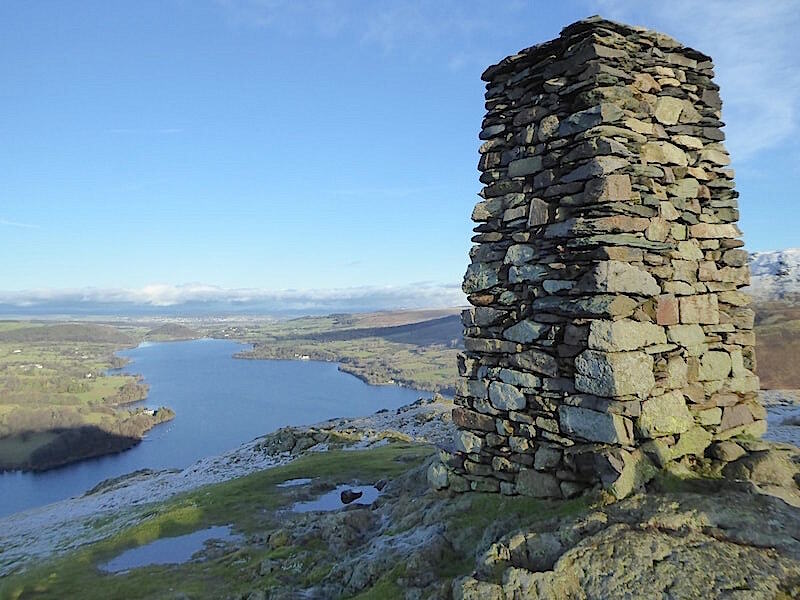 It doesn’t take long to reach the top of Hallin Fell, by the direct route from The Hause at least, from where you can enjoy some wonderful views. 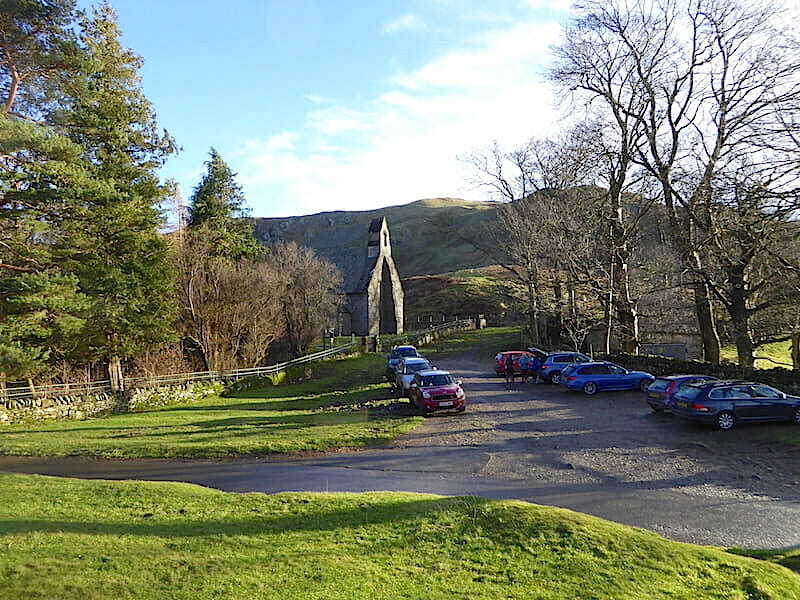 With its fresh covering of snow and a bright sunny afternoon the surrounding landscape looked absolutely stunning. 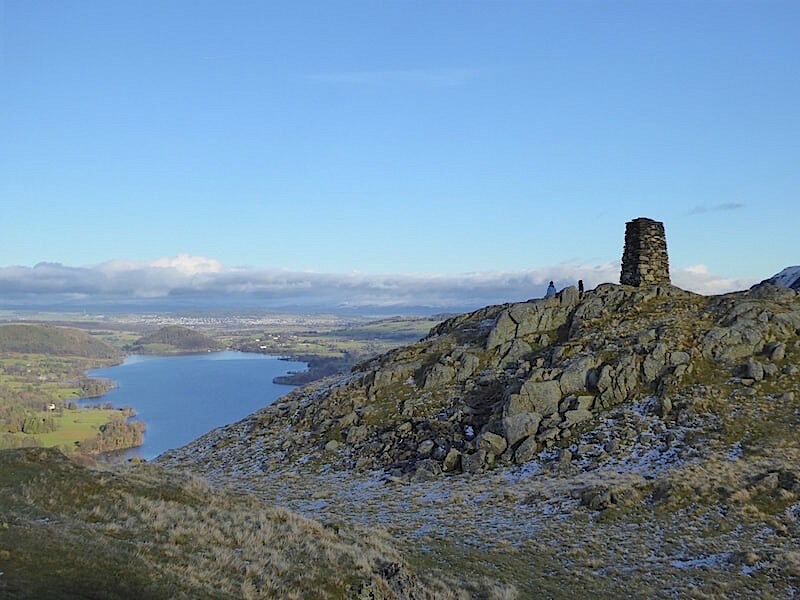 A clear view along Ullswater towards Penrith and onwards to the cloud covered northern Pennines, with two more walkers enjoying the superb views from Hallin Fell’s obelisk. 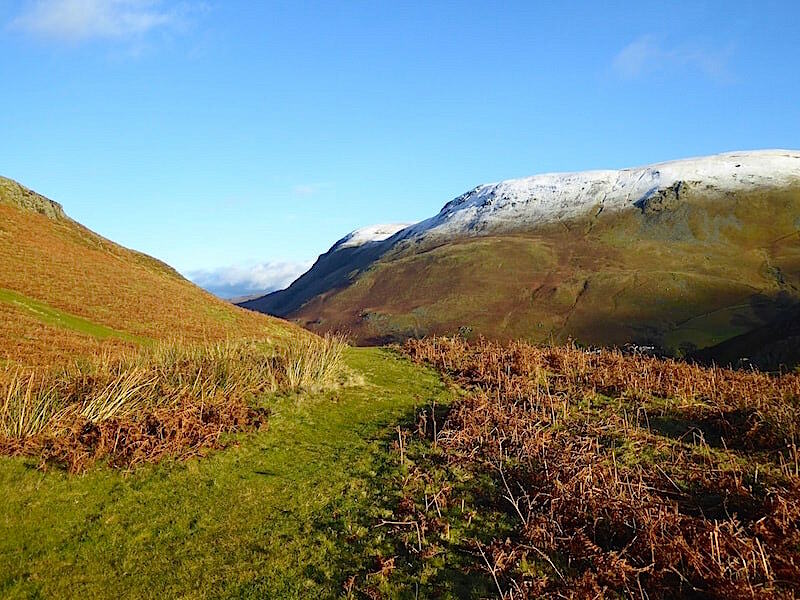 The tops of the two Mell Fells were just visible to the left of the obelisk. 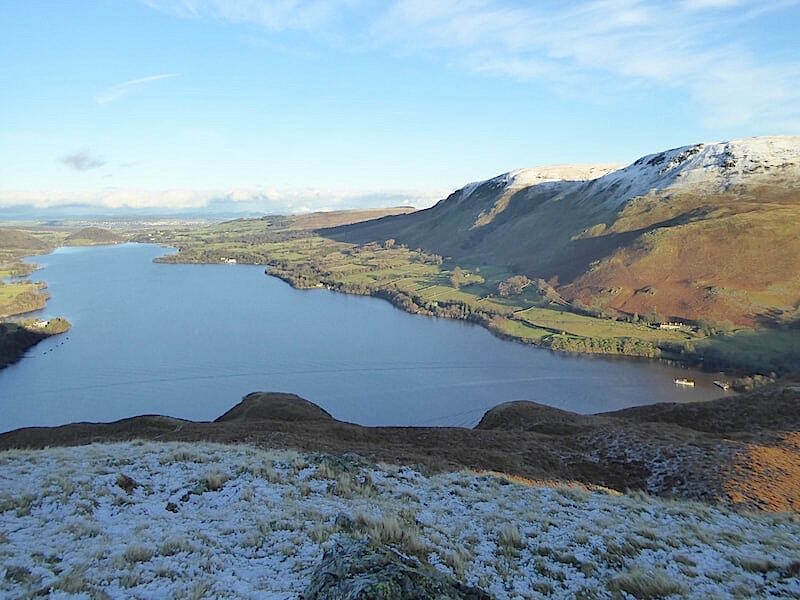 The view north eastwards along Ullswater from the obelisk. The Eden Valley, between here and the cloudy northern Pennines in the distance, is getting the best of the sunshine today, as it often does since it has nothing of any great height to generate much cloud activity. 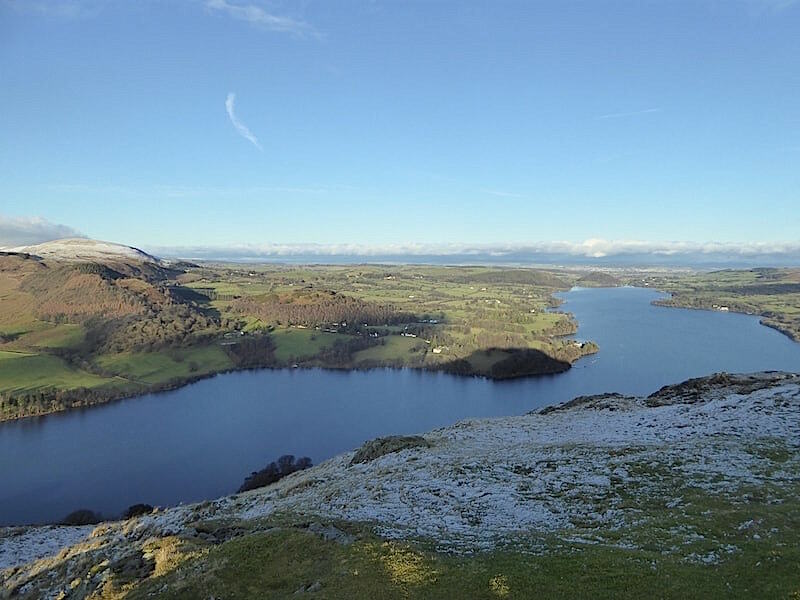 Let’s hope that potential zip wire developers won’t go getting any wild ideas about Ullswater either. 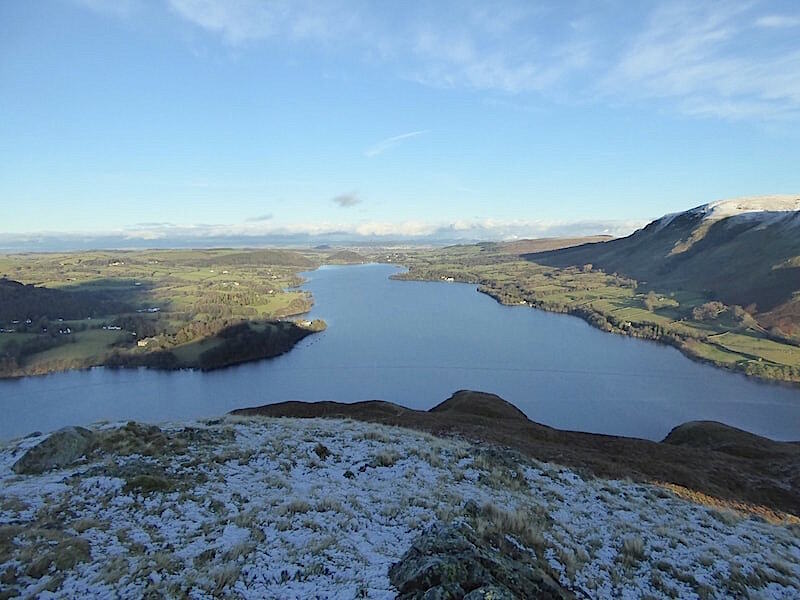 Lord Birkett rallied enough support in his opposition to Manchester Corporation’s plan to turn this body of water into a reservoir to prevent it happening so let that be an end to any more thoughts of ‘developing’ the area. Its already developed itself beautifully enough, thank you very much. 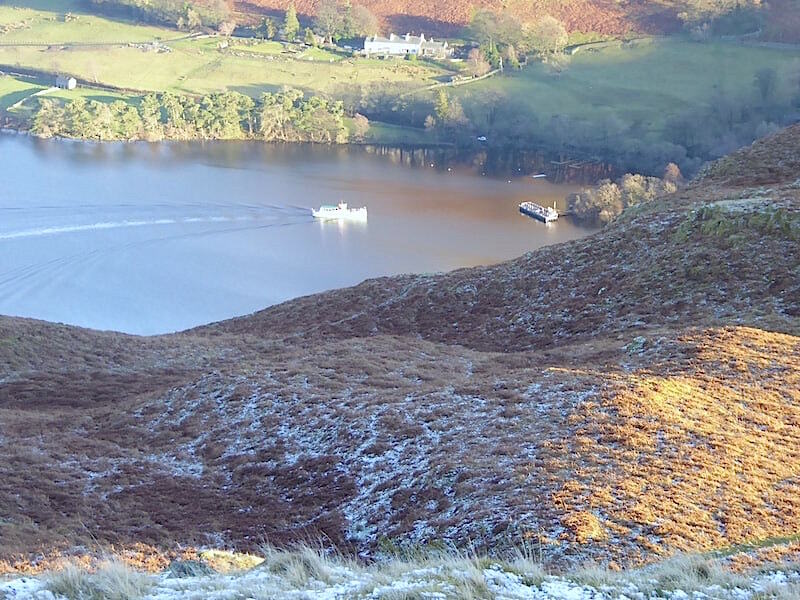 One of the Ullswater steamers sails serenely below us as it makes its way round to Howtown. 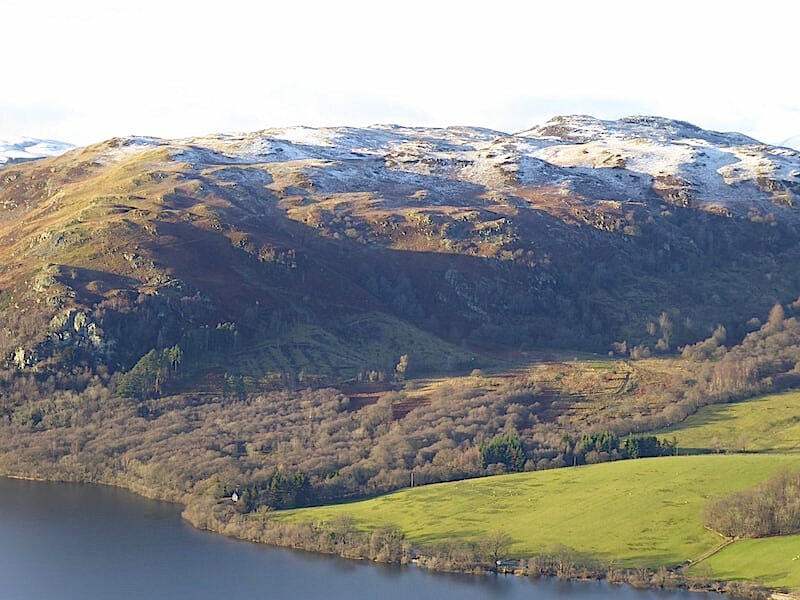 Above the trees and fields of Glencoyne Park is the long wall traversing the snowy slopes of Watermillock Common, and to the left of the Common another wall rises up to Birkett Fell, so named in honour of Lord Birkett following his successful campaign to keep Ullswater out of the clutches of Manchester Corporation’s plans. 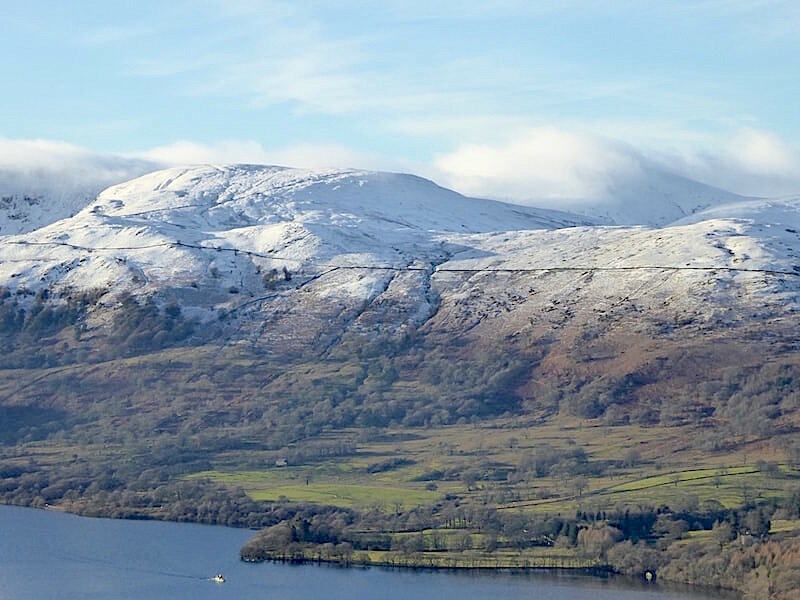 Not only does he have a fell named after him but he has been remembered every year since 1963 by the Ullswater Yacht Club in their Lord Birkett Memorial Trophy yacht race which is held annually every July. Can’t see that happening to any zip wire installer. 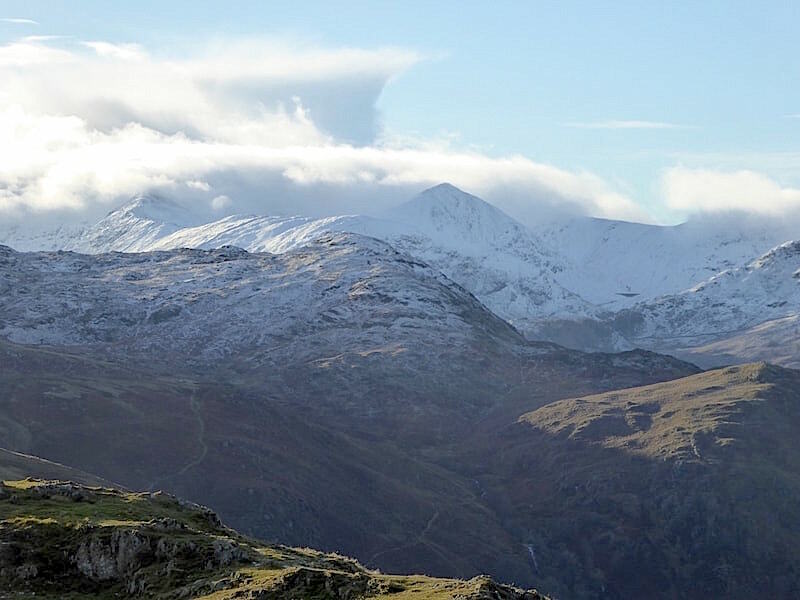 How come Catstycam, the pointed peak on the centre skyline, manages to stay free from cloud when Helvellyn, its next door neighbour is completely obliterated by it? There’s also a good view of a section of Striding Edge, to the left of it, beyond which walkers along the Edge would not be getting much by way of views, either of the surrounding fells or what a long drop it is down to Red Tarn, although that at least might bring some comfort to any walkers across there who might be suffering from vertigo. 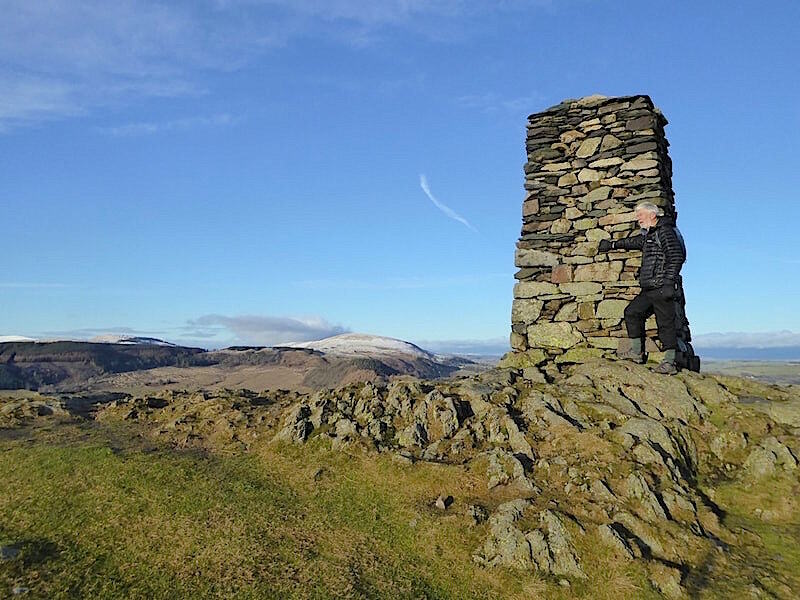 On Hallin Fell and busy doing nothing but watching nature at work. 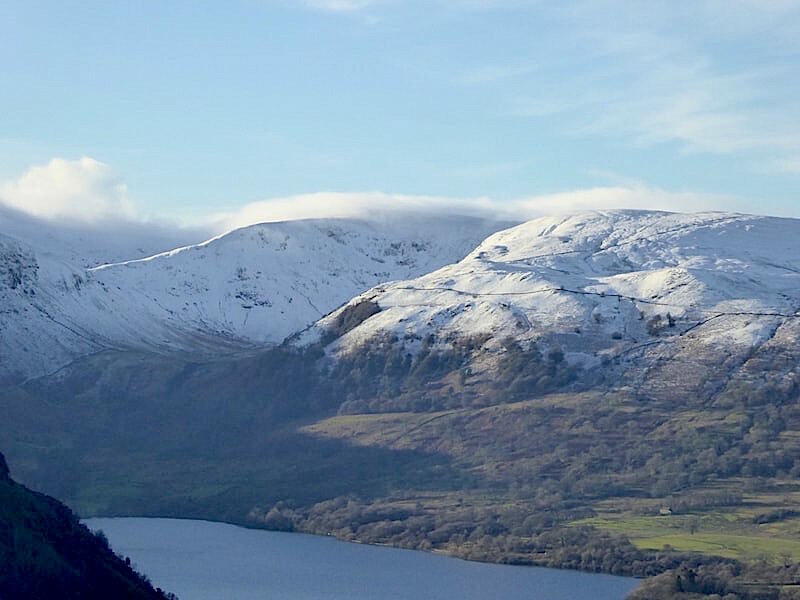 The boiling clouds are rolling across White Side, Raise and Stybarrow Dodd. 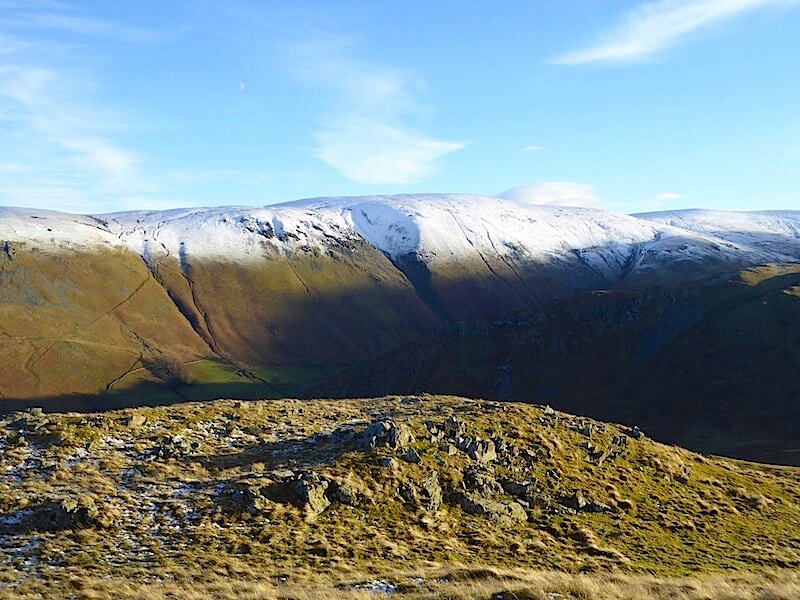 Below them the snow covered slopes, crags and summit of Sheffield Pike stand out clearly, as does the connecting ridge to Green Side to the right of it. 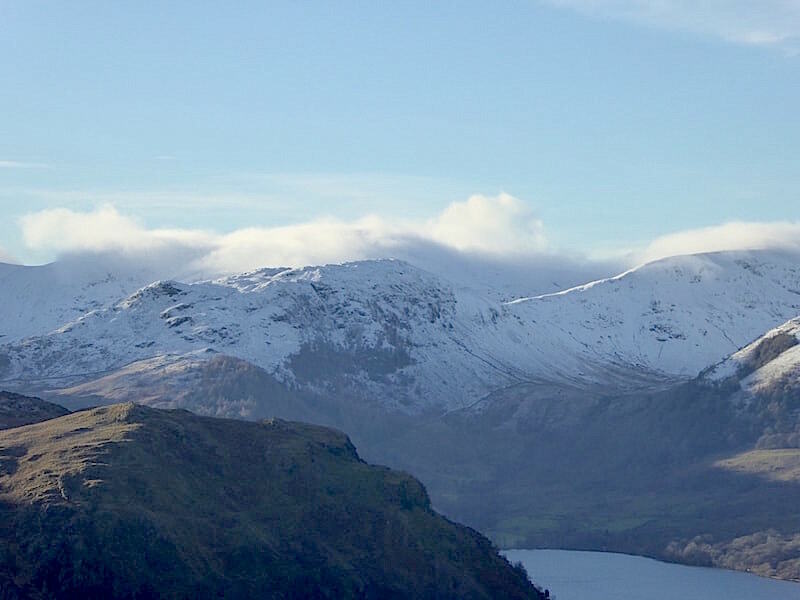 Below Sheffield Pike the diminutive Glenridding Dodd has been given a slight dusting of snow, and below that there is no visible sign of winter anywhere across the lower peaks of Place Fell. Green Side and Stybarrow Dodd with cloud streaming across them but no such activity on Hart Side and Birkett Fell to the right of them. Behind Hart Side another mound of billowing cloud suggests that Great Dodd might not be that great a place to be walking today, well not if you wanted any views that is. 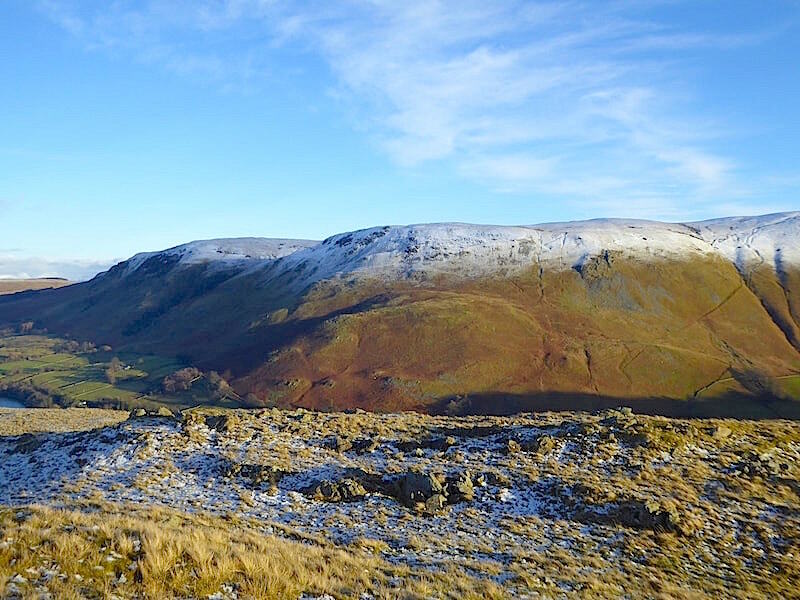 Good old Gowbarrow, clear as a bell and with enough sunny and snow dusted humps and bumps to make for an interesting winter ramble. 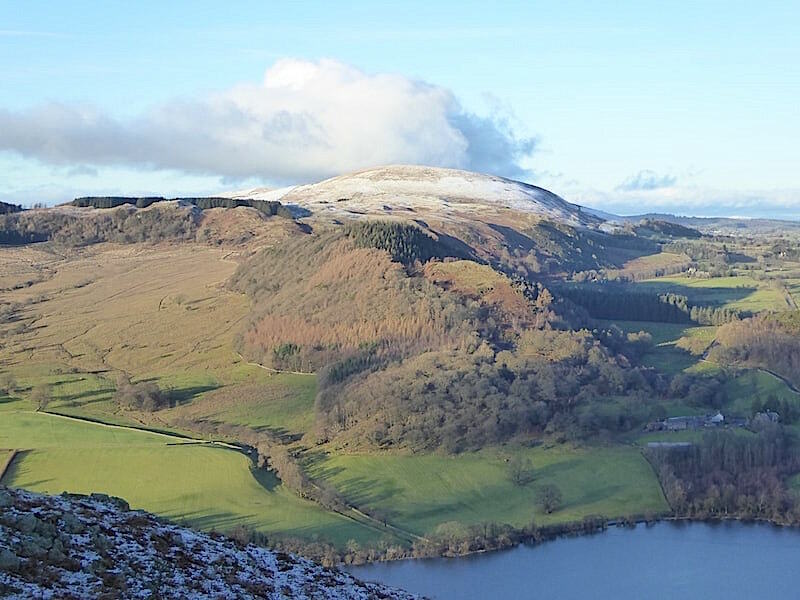 You could spend a whole day on Gowbarrow just exploring its many nooks and crannies. It may not be one of the great big macho ones but its a great little fell in its own right. 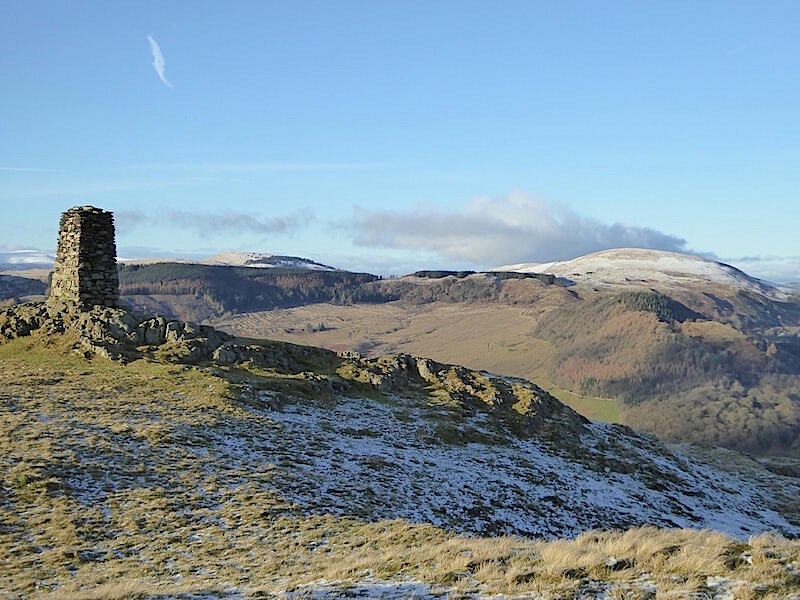 To the south east of the summit area there was this sunny, blue sky view of Steel Knotts and the High Street range of fells. To the left of the previous shot is this view looking towards Wether Hill. A little further to the left we look over towards Loadpot Hill. 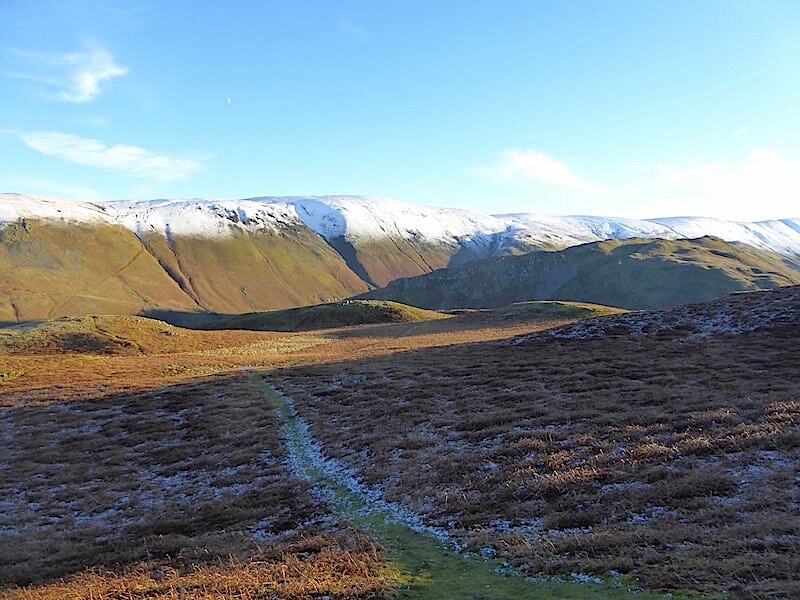 To the north west the tops of the two Mell Fells appear once again. The steamer we had seen earlier approaches the Howtown jetty …..
….. and from there will make its way down to Pooley Bridge down at the foot of the water, before turning round and repeating the process before making its way back to Glenridding. I expect that will be its last trip of the day now that the afternoon is wearing on. 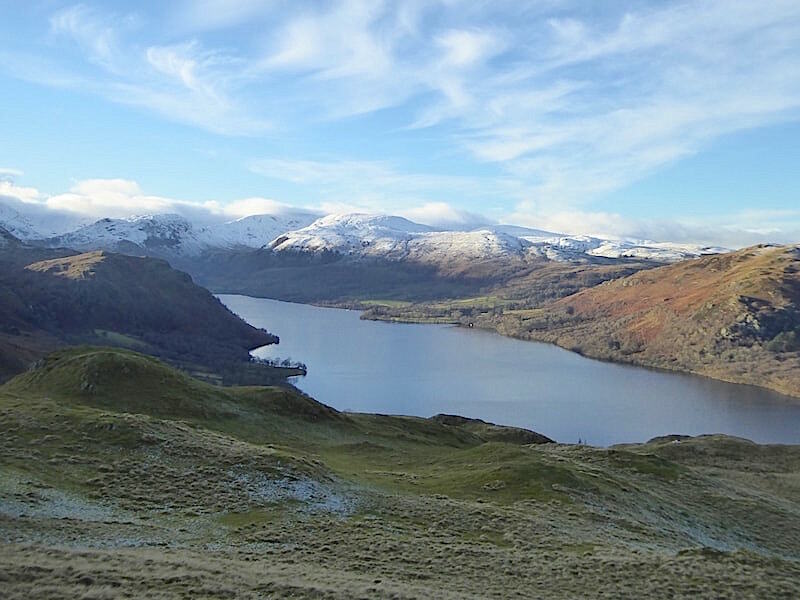 One last look along Ullswater before we start making our way back down. 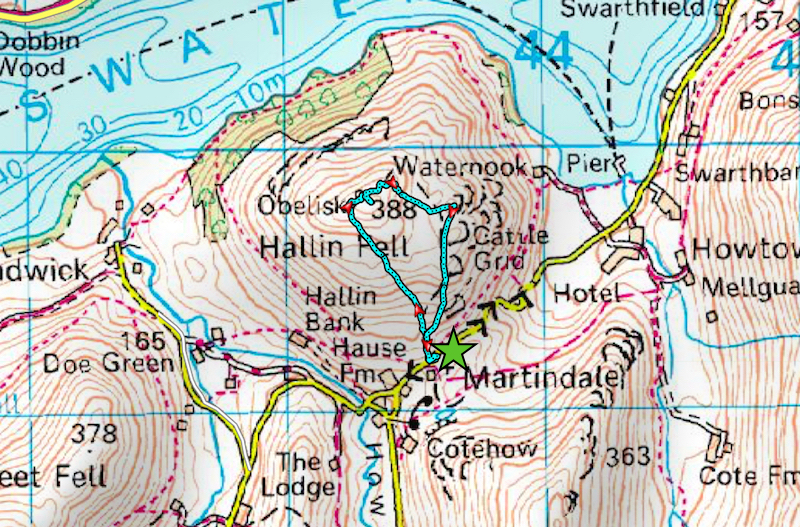 Not forgetting to take a look back to the obelisk and the small cairn just below it. 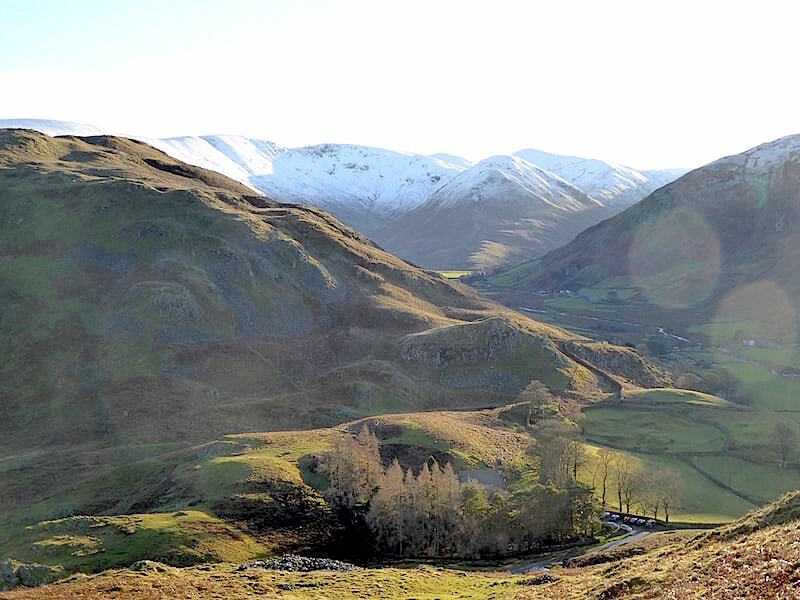 Oh go on then, just one more of Little Mell Fell rising beyond the tree covered slopes of Birk Crag. 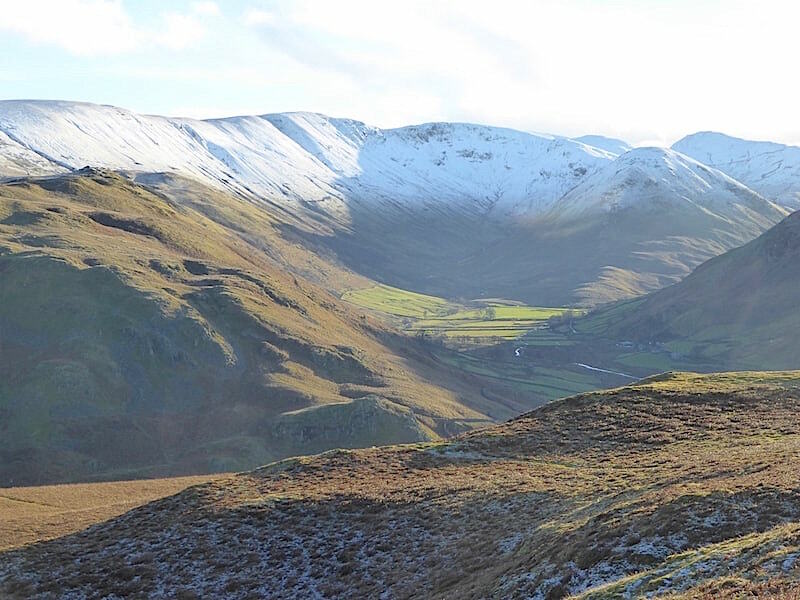 Down we go, with Rampsgill Head and its neighbouring fells looking lovely in the soft afternoon light …..
….. and the long line of the High Street range looking their wintry best in the bright sunshine. 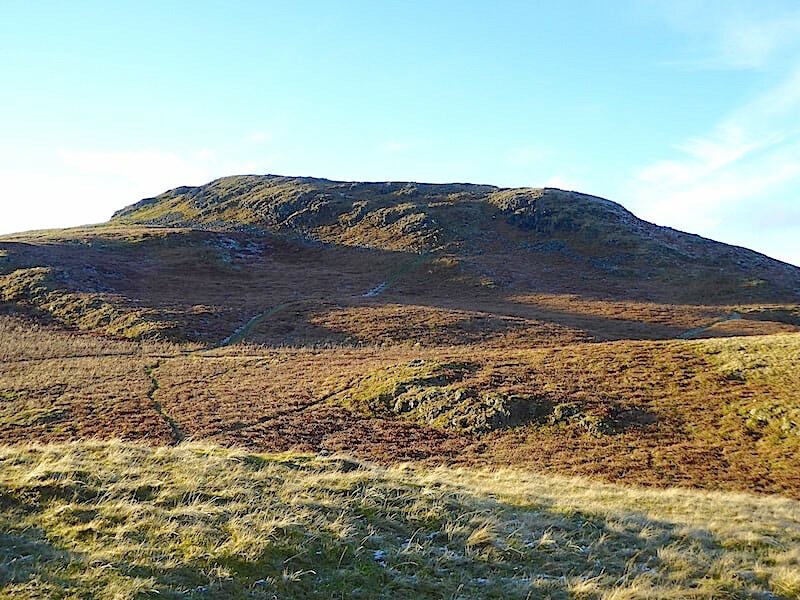 A look back at the summit area of Hallin Fell …..
….. before continuing on down to The Hause. Lovely golden light as the shadows begin to lengthen …..
….. so another look back at the summit area just to make the most of the light. Another party of walkers making their way down behind us. 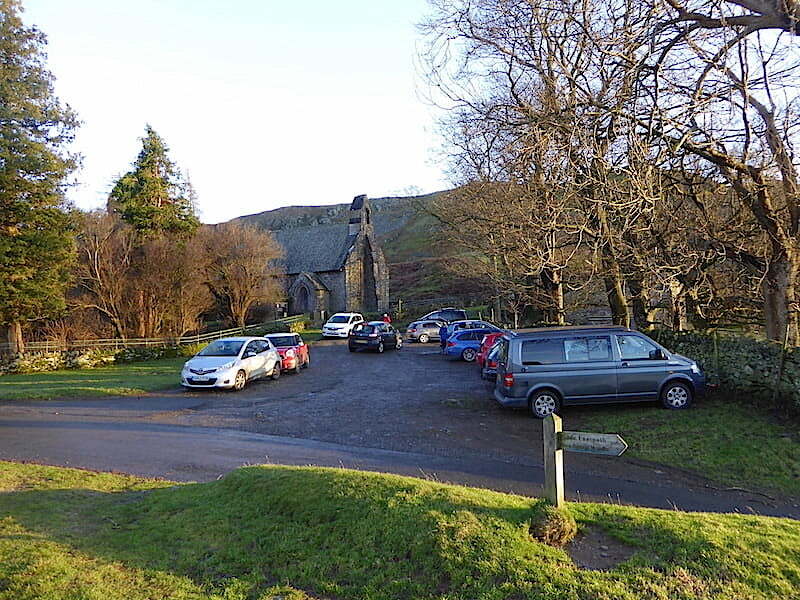 The afternoon may be wearing on but cars were still arriving and looking for parking spaces down at The Hause …..
….. where the car park or the roadside parking hasn’t thinned out very much since we started out. 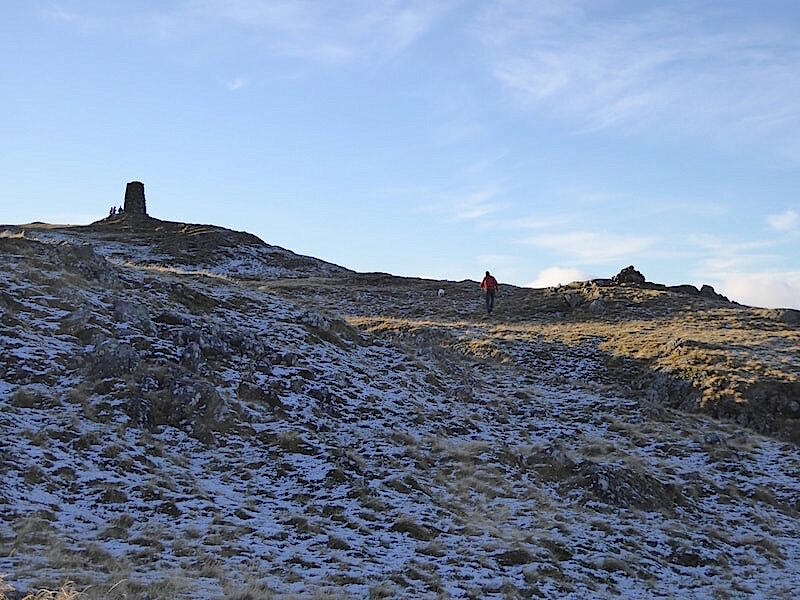 Well, it was only a very short walk with most of our time being spent wandering around the summit area simply enjoying the views and the calm, sunny weather which suddenly appeared out of nowhere. You have to grab any good weather opportunity while its there because you never know when the next one will turn up. A little bonus awaited us at the top of the lane leading from the A6 over to the village where we live so we stopped for a couple of photos. 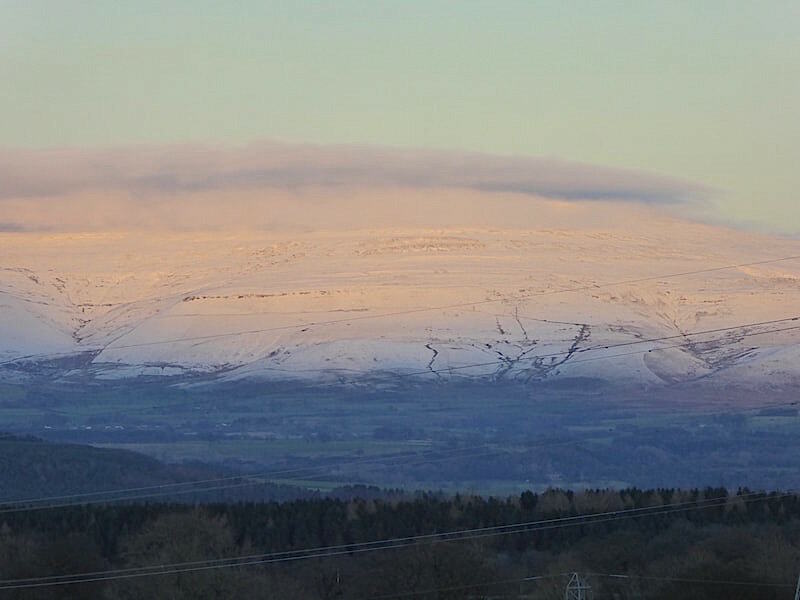 Cross Fell, whose summit is covered by cloud as it so often is, is directly opposite across the Eden Valley. The snow is covering the slopes down to valley level and the setting sun behind us is creating some fabulous soft colours across the snowy slopes. Cross Fell’s next door neighbours on its south side. 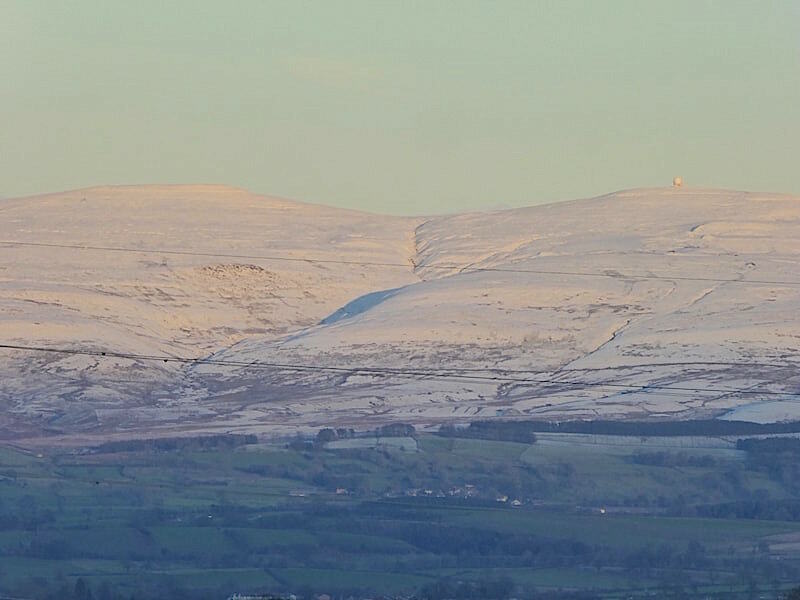 Little Dun Fell, on the left, and Great Dun Fell plus its Civil Aviation radome, on the right, are also getting the golden glow treatment. The sun sets all too quickly, the beautiful colours fade away into the dusk of late afternoon and the only thing left to do is drive back home and get the kettle on, mince pie anyone?